Shopping centre owners have become the latest links in the retail chain to take a beating, as one investment bank published a brutal review of their prospects. In a note, Morgan Stanley said it would ‘continue to shy away’ from investing in property stocks which seemed to be surprisingly cheap. These often included companies focused on the UK retail sector. Hammerson, which owns 22 shopping centres and 15 retail parks in Europe, saw £193.3m wiped off its market value as Morgan Stanley lowered its target price from 565p to 510p. Its shares fell 5 per cent, or 24.6p, to 467.8p. Intu, which has 17 UK shopping centres, with 35m customers through the doors every year, dropped by 3.4 per cent or 5.5p to 156.25p as the bank recommended a reduced target price of 150p. Intu and Hammerson recently flirted with the idea of a merger before Hammerson got cold feet. Not even luxury operators were spared. Capital & Counties, which manages more than 1m square feet of space in London’s Covent Garden and has brought brands such as Chanel and Mulberry to the district, took a 2.7 per cent hit as its shares fell by 7.1p to 256.9p. Property values have started to fall in the UK, Morgan Stanley warned – the Landsec-managed Bluewater mall in Kent was revalued down by 11 per cent in the six months to March. Added to that, retailers have been squeezed out of big shopping centres as rents climb, business rates soar and shoppers head online. The FTSE 100 was also weighed down, as it ended the day 0.6 per cent lower at 7516.03 points amid renewed tensions between the US and China. Vodafone slid 3.1pc, or 5.42p, to 167.52p, as Bank of America Merrill Lynch said short-term headwinds were mounting. Pressures such as competition in Spain and Italy, depreciation in the Turkish lira and increased costs could take their toll, analysts said. Drugs giants Astrazeneca and Glaxosmithkline were unable to boost the index, despite each having one of their drugs approved for use in Europe. Patients with type two diabetes will now be able to control their blood sugar levels with a once-weekly injection, rather than having to dose themselves with insulin multiple times a day, using an Astra device. Shares gained 0.4 per cent, or 21p, to close at 5910p. But Glaxo fell, by 0.6 per cent or 9.2p to 1590.8p, even though the EU gave the thumbs-up for a drug to treat children with severe asthma. But one pharmaceuticals-focused company on London’s junior market managed to pull investors on side. Duke Royalty, which invests hefty sums in research labs in return for the future royalties they are paid by drugs giants who use that research, climbed 3.2 per cent or 1.4p to 45.9p. The company announced that it had made its largest-ever royalty financing agreement with Interhealth Canada, which develops and commissions healthcare facilities, for £10m. In the FTSE 250, international energy company Hunting motored ahead and restored its dividend, as rising commodity prices and a recovering oil market helped boost its performance. AJ Bell investment director Russ Mould said: ‘There is very strong US demand for Hunting’s perforating gun, a device used to penetrate oil and gas wells in preparation for production.’ Shares rose 11.9 per cent, or 90.5p, to 849p. Inkjet business Xaar printed little to impress investors in its latest trading update. 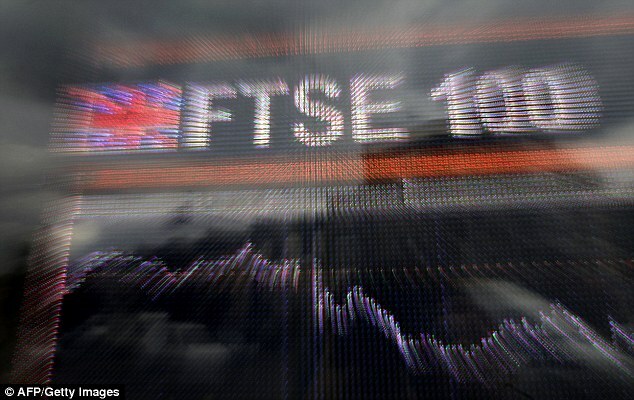 Its shares plummeted 29.6 per cent, or 72.75p, to 173p, as it said trading had been disappointing. The board said it was reviewing ‘strategic options’.